Have you ever wondered how much it is costing you to produce a dozen eggs? Have you thought of selling some of your surplus eggs but wanted to know how much to charge to cover your costs? Would you like to know how many eggs per day on average your hens are laying? 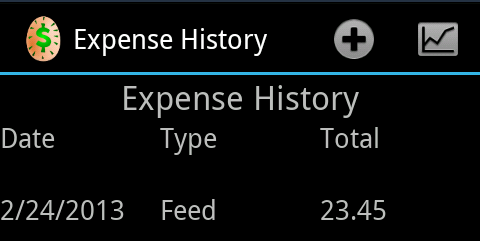 I have created a chicken expense tracker for Android, Eggspense, to answer these questions. Click here to read more about the app. Track all your chicken keeping expenses. There is an app for that. 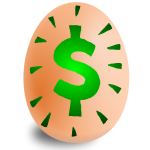 Eggspense allows you to enter any type of expense you want. Feed, fencing or coop construction costs can be logged. Simply enter a description and a dollar amount. These expenses will then be used in the calculation of statistics such as total expenses and the cost to produce a dozen eggs. 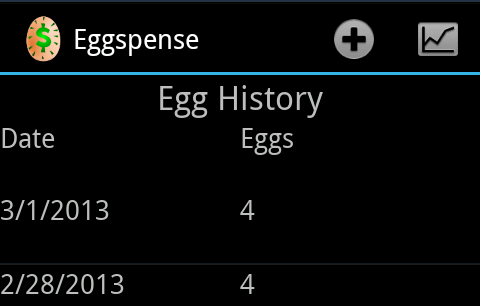 Eggspense makes it convenient to log the daily egg collection. If you are like me and have a small flock of layers, you only buy feed every once in awhile. It would not be too difficult to keep track of this expense. Egg collection is something that must be done daily. If you are trying to keep records of egg production it can be easy to miss a day. That is where Eggspense comes in. The app makes it convenient to enter the number of eggs collected that day. 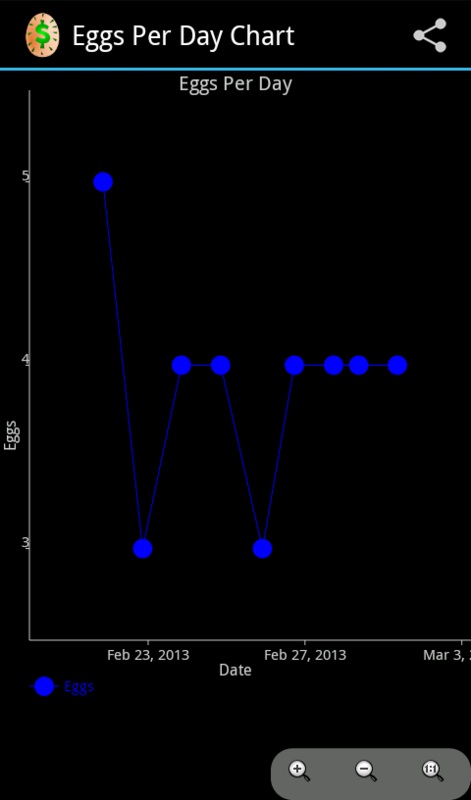 Watch for trends in the eggs per day chart. Once you have entered all your egg collection data, Eggspense can graph it for you. 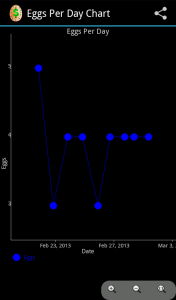 Monitor the graph to look for trends in your flock’s egg production. Have the hens been laying more eggs lately? Is production declining? The eggs per day chart will show these trends. Eggspense makes it easy to share these charts to your favorite social network or even via email. Simply tap the share icon in the upper right of the Egg Chart screen and choose where to share the chart.